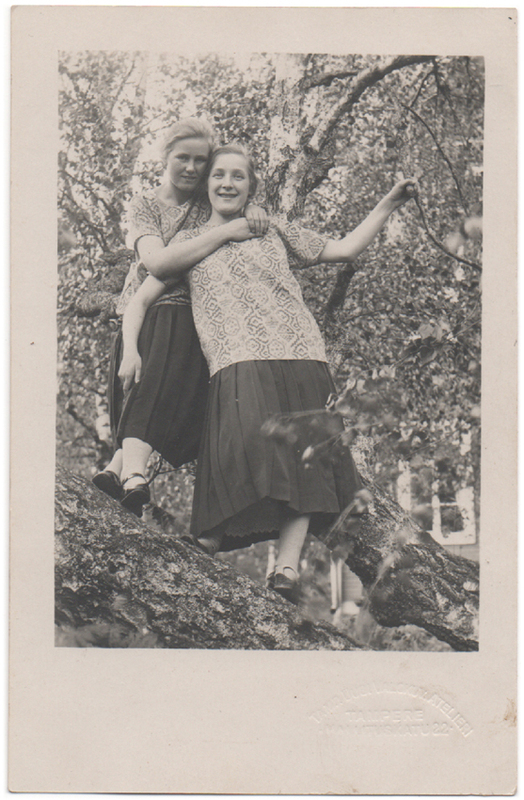 A photograph of two girls up in a tree, wearing identical clothing and holding on to each other, smiling. It is impossible to tell if the girls were sisters, best friends or sweethearts, but it is obvious they were close and very fond of each other. On the bottom of the photograph there is a faint stamp with some text: “Tampereen Uusi Valokuvaus Atelieri, Tampere, Hallituskatu 22” – the name and address of a photography studio. According to the Finnish Museum of Photography there has been two separate photography studios by that name in Tampere with no shared connection whatsoever besides the same name and the fact that these studios, rather confusingly, even operated in the same address for some time. (source) The first Tampereen Uusi Valokuvaus Atelieri was in operation in the early 1890’s, and since this photograph is newer than that, it is clear that this mention here refers to the second Tampereen Uusi Valokuvaus Atelieri, which began its operation during the early 1900’s and continued for some decades. The photograph has been taken in Tampere, Finland, possibly during the 1930’s, or perhaps 1940’s. Someone with more knowledge of the dressing styles of the era might be able to come up with a more precise dating.